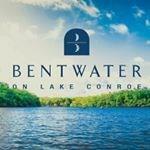 Live in the exclusive private gated community of Bentwater. Two lots within walking distance to the marina and their beautiful pool. Water view, corner lots, boating, skiing, fishing, tennis and of course golf and country club.